With the Mets’ and Yankees’ seasons in full swing, and thousands of Brooklyn children experiencing the joys of Little League, this Saturday—and again on May 10—Gotham SideWalks will present Bike Brooklyn Baseball Tour, an intimate journey through the formative century of 1850 to 1950 when professional baseball was dominated by New York teams and our beloved borough played a leading role. Advertised by Rich Garr of Gotham SideWalks, as “100 years of baseball in 10 miles,” Bike Brooklyn Baseball Tour takes a leisurely three-hour trek through the seminal sites and historical record of Brooklyn’s unprecedented place in baseball history. Garr takes participants back to an earlier time—the mid-19th century—when Brooklyn was both a suburb to Manhattan as well as a working class haven packed with industry. According to Garr, then as now it was space that separated the two boroughs, as Brooklyn’s open, underdeveloped spaces set it apart from it’s densely populated neighbor. Starting from the Old Stone House in Park Slope, the Bike Brooklyn Baseball Tour is an excursion deep into the heart of Brooklyn’s past. Beginning in the 1850’s the Old Stone House was the site for informal baseball games, and later in the century early ballparks there housed what would eventual became the Brooklyn Dodgers. From there the group will bike to the Prospect Park Parade Grounds, described as an “incredible repository” of amateur baseball history. Whenever Brooklyn is referenced in with what has been called America’s pastime, the beloved Dodgers—untimely ripped from our borough by the villainous Walter O’Malley—are usually the beginning and end notes in any story. 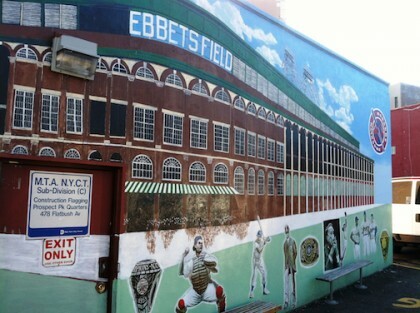 No exploration of our borough’s illustrious baseball history would be complete without a visit to the location of legendary Ebbets Field. According to it’s founder, Gotham SideWalks offers more than just baseball history. Garr, a visual artist who started Gotham in 2008, has an affinity for art-centric adventures. Capitalizing on the notoriety generated by street artist Banksy’s self-proclaimed “NYC residency” last year, Garr’s “Street / Art, Lower East Side” walking tour has been in much demand. Gotham also offers “Coney Island’s Talking Boardwalk,” an extremely popular summer excursion. Meeting Place: the Old Stone House in Park Slope: 336 3rd St. in Washington Park (11215). Trains: F/R train to 4th Ave.